Some pretty interesting stuff from the May 2010 issue of Fast Company. 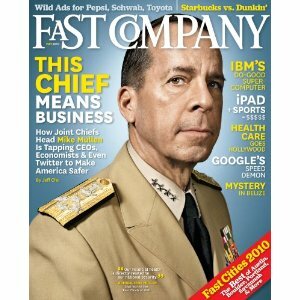 The cover story is a profile of Admiral Mike Mullen, Chairman of the Joint Chiefs. Written by Jeff Chu, "Mullen on the Move" is an interesting look at the nation's top military officer. What comes across is a guy who combines together a huge work ethic (as evidenced by a snapshot of one day's schedule) with what appears to be an excellent grounding in his role and that of the U.S. Armed Forces. 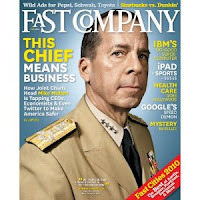 In terms of his role, Mullen describes himself as being someone who doesn't necessarily do anything (in the sense that he doesn't make troop decisions), but does seek to advise well President Obama and Secretary of Defense Robert Gates as his bosses. Beyond that, he comes across as a strong advocate of the military understanding and interacting with both business and the public. 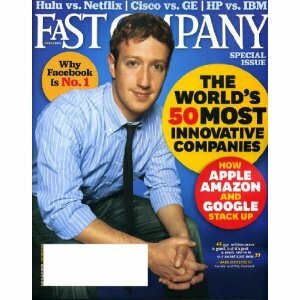 From dinners with CEOs to time on Jon Stewart and Facebook accounts, he does seem to be a guy that... gets it. As he says "I am resourced by the American taxpayer. I take great care with the stewardship of the money they pay for the national defense." Two other things of interest from this issue were this piece on IBM's World Community Grid (whereby spare computing power is used for large scale public good projects) and this on Susie Wee and touch efforts from HP. Tis' the thing of the future, that touch technology. Finished reading "The Checklist Manifesto" by noted surgeon Atul Gawande and found it to be a fairly interesting book. Gawande is the author of two bestsellers that I enjoyed quite a bit, "Complications" and "Better"... both about his experiences as a doctor. Where "The Checklist Manifesto" diverged is that is covered not just medicine, but the wider-reaching concept of using a checklist in the pursuit of excellence. Fields discussed in the book range from aviation (where the checklist is perhaps most ingrained) to investing, building and yes... surgery. While I found definite value in the checklist concept, I was more captivated by his prior two books in that they were all about a topic that he's dedicated his time to. Gawande is a good writer (contributes frequently to The New Yorker), though, and I'm interested in his National Magazine Award winning piece "The Cost Conundrum" (on health care expenditures in McAllen, TX) linked to from his website. I'd recommend "The Checklist Manifesto" to anyone who either enjoyed Gawande's previous two books or is interested in the idea of peak performance and how to attain it in a given effort. Two interesting stories from the Apr 12 issue of BusinessWeek. The first was titled "Alan Mulally's Asian Sales Call" and details how Ford Motor Co. and it's CEO have been focusing on expanding it's minimal 2-3% market share in India, China and surrounding countries. On the heels of other posts I've done on Ford lately, it really does seem the company is both making good moves and has a huge opportunity to grow. The second was "The iPad, Your Newest Workplace Productivity Enhancer" about... yep, the iPad. The new boy wonder device from Apple has been pretty much everywhere lately including a recent cover story in Time linked to in this post, but what was interesting about this BW piece was the notion of the iPad for work. With someone like Marc Benioff of Salesforce making quotes about the iPad, perhaps it's applications (no double entendre intended) do go beyond entertainment to work functional. Recently finished “Have a Little Faith” by Mitch Albom and found it a nice read. Albom is a Detroit-based sportswriter (website here) who also wrote the bestselling memoir of alltime, “Tuesdays With Morrie” about his time spent as an adult with his aging former college professor. In a very similar vein, “Have a Little Faith” is about the time Albom spent with his lifelong Rabbi as well as a recently met pastor in poor inner-city Detroit. Through the tale of these Men of God (but, different Gods) and his interactions with them, Albom weaves a narrative of faith, hope and impact. The faith part is summed up well by the Rabbi with "faith is about doing… you are how you act, not just how you believe” when speaking of the import of ritual in daily life. The hope part applies in great measure to the Detroit pastor who struggles to keep his hole in the roof and no heat inside Church operating as… a Church. The impact part could pertain to either the Rabbi or Pastor, but for me, I felt it applied best to Albom himself… and what came out of his local newspaper columns on the Church. “Have a Little Faith” definitely has a religious component to it (and multiple religions at that) and for that reason and others may touch some readers more than others, but back to what was said at the beginning of this missive… it’s a nice read. Really good feature on Steve Nash in the latest issue of Sports Illustrated. The story is titled "The Genuine Point Guard" and interestingly (well, to me) was written by Charles Pierce. I first came across Pierce probably ten years ago via his book "Sports Guy" and have since seen him published (fairly regularly) in Esquire. Just a really good writer who penned the late 2008 essay "American Surprise: How Election Night Brought Us Home Again". In Nash, there seems to be a really good guy who acts good without ulterior motives. An admirable concept that Pierce does a great job of bringing home to the reader through his usage of language and the meaning behind specific words. In short, words they be might powerful things and are used really really well here by Pierce. Compelling piece by Joe Posnanski on CNNSI. Titled "Magical game comes down to last shot and Duke earns greatness", it's all about the Duke NCAA basketball title. Really, though... it's about the excitement of sports and how anything can happen. Very cool stuff. Excellent cover story from the latest issue of Sports Illustrated. Written by Tom Verducci, "What Makes Roy Run" is a detailed profile of new Phillies ace Roy Halladay. 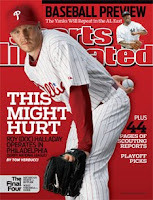 I found myself drawn to the story of Halladay for the same reason I found compelling this SI story on Sidney Crosby (which I posted on here)... it chronicles a gifted athlete who works perhaps harder than anyone else to become even better. So much to be said for someone that couples together work and skill... and it would be so easy to just be content with being near, but not at the top of the game.